Leftovers get a bad rap. It wasn’t until I got out on my own that I realized the value of leftovers, both from an economical standpoint and a creative one. Repurposing yesterday’s meal into something new and appetizing is one of the great tests of a home cook, and many of our favorite dishes the world over originated as just that: a way to disguise and stretch leftover bits of food. Putting leftover rice to good use presents a particular challenge since it doesn’t reheat well on its own. 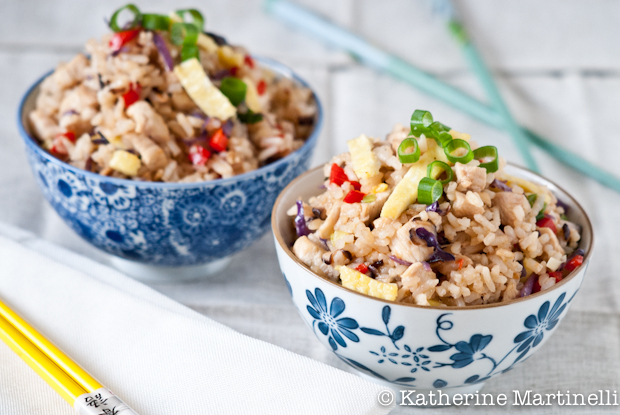 Fried rice is the perfect way to use up leftover rice, with delicious results. Since rice is such a staple across Asia, there are seemingly countless variations on fried rice. In Indonesia and Malaysia there’s Nasi Goreng, a mix of rice, sweet soy sauce, meat and vegetables that is often topped with a fried egg. Korea has kimchi bokkeumbap, or kimchi fried rice, while in the Philippines there’s garlic fried rice and Singapore offers sambal fried rice. But Chinese fried rice is arguably the most internationally recognized variety, but even within China there are innumerable regional differences. As with many dishes that arose as a way to use leftovers, fried rice must be made with leftovers. You really need to start with leftover, cold rice that’s on the drier side so it doesn’t stick to the pan. Fried rice offers the ultimate way to use up leftover rice, as well as whatever vegetables and meat you have lying around. Although it’s been around for centuries, it’s as applicable to kitchens today as ever. 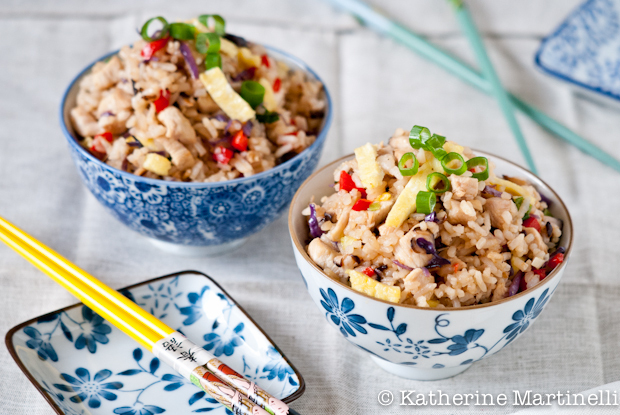 Popular in different versions all over Asia, this fried rice is inspired by the popular Chinese renditions. Once you have the basic technique down, the rest is up to you and what you have in your fridge. It’s a great way to use up any vegetables that may otherwise languish in the crisper as well as whatever meat, fish or tofu you fancy. Put the eggs in a small nonstick pan over medium heat. Allow to set on the bottom, then flip like an omelet. Cook until set all the way through, slide onto a plate and allow to cool slightly. Slice into bite-sized strips and set aside. Heat the oil in a large wok or wide rimmed pan over high heat. Add the garlic and ginger and sauté for 1 minute. Add the pepper, cabbage, mushrooms, and scallions and sauté for a few minutes, until just softened. Add the rice and sauté for another few minutes until the rice is fully heated through and just starting to brown. Taste and season as needed. Remove from the heat and stir in the cooked egg. Serve immediately, garnished with sliced scallions if you like. What a fun theme this week Katherine. Thanks so much for hosting! What a fun theme this week Katherine…Thanks so much for hosting! Fried rice is terrific stuff, and your recipe looks excellent. You’re right that it’s such a great vehicle for leftovers! And I like it enough that I sometimes make rice just so I can make fried rice. 😉 Good stuff – thanks. It was funny when I saw your post Katherine because I made a fried rice with leftover just last night. 🙂 Great hop! I linked in a guest post by my sister who made a chicken pot pie from leftover, including the biscuit topping. Thanks for hosting! Hahaha great theme! Working from home I do love my leftovers (as well evidenced by instagram ;D) and most of them end up mixed into soup or fried with an egg on top… you’ve also just reminded me that I have a Quinoa Fried Rice post still waiting to see the light of day – thanks! In the interests of health it would be great if you suggested brown rice. So many nice recipes. Thank you. Have a great weekend! ur recipes are delightfully easy and well presented. big thanks.